The InterTrax2 is the smallest high performance head tracker in the world and it is destined to turn heads. 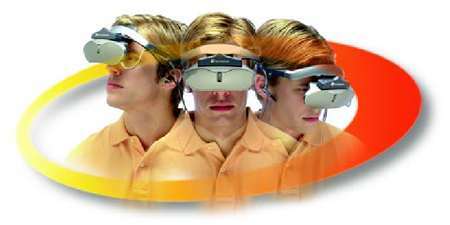 It is designed to add motion tracking functionality to heads up personal displays which will enrich 3D design, game play, or web visualization. The InterTrax2 is a fraction of the weight and size of the earlier model and it has greatly improved performance. The InterTrax2 will change your view of motion tracking forever. Improving on the InterTrax, the InterTrax2 is positioned and priced to become the defacto standard motion tracking system for personal heads-up displays. The growth of 3D games with the explosion of the internet creates enormous potential. On the web our motion tracking technology can be used to allow browsers 360 degree tours the house of their dreams via the web with companies like I-Pix and Remote Reality. Or create interactive health and tracked fitness programs that monitor and guide users with real-time web based instruction. When used with a head mounted display, this feature allows you to create a virtually unlimited desktop space. Instead of the 800 by 600, offered by SVGA display, you can have an 8000 by 6000 desktop extending all around you. Windows on the display are moved in direction opposite to the movement of the head, creating an illusion of a being surrounded by a huge screen. You can assign a key combination to be used to reset the tracker heading (yaw) to zero. This is very useful, since most applications, even including many that are written specifically for InterSense devices, don't have this functionality. There is also a key assignment available for control of the Virtual Desktop functionality.